I said in my last update that, although there were lots of SEN events in the first few months of 2014, the next few months were not going to be as busy. I still highlighted a couple of events: such as the Autism Show in London on 13/14 June and in Manchester on 27/28 June 2014 (both happening now and in a fortnight); and the Westminster Education Forum on 8 May 2014 entitled: ‘Special Educational Needs & Disabilities – Implementing the Children and Families Bill’ (which has now passed). In fact, although I did not mention it in my last update, I also attended The Transition Event that was held in Birmingham on 22 May 2014 which focuses on Post-16/19 provision. I want to highlight here some of the things that I have learnt personally from attending these last two events. The Westminster Education Forum event was split into two halves. There were two keynote speakers followed by short contributions from specialist panels. The first keynote speech was given by Stephen Kingdom from the DfE who spoke about ‘Reforming Special Educational Needs and Disability Provision for Children and Young People’. He was then followed by two panels of speakers talking about ‘Putting Education, Health & Care Plans into Practice: Challenges Surrounding Integration and Implementation’ and then ‘Personal Budgets and the Local Offer’. The first half was chaired by Tribunal Judge Meleri Tudur - the Judicial Lead in the SEND Tribunal. There were some good points made by everyone involved stressing the aspirational aspects of the new SEN framework but also highlighting the potential pitfalls as well. But I was particularly taken by the second keynote speech from Alison Boulton, the Chief Executive of NATSPEC (The Association of National Special Colleges). She gave a talk entitled ‘Post-16 Support for Young People with SEND – Current Provision and the Impact of the Children and Families Act’ and this was then followed by a panel discussing ‘Extending Support for 16-25 Year Olds’. Alison informed us that NATSPEC is the membership association for 65 specialist Colleges with about 3400 students with some of the most complex needs. She also pointed out that they work very closely with the Association of Colleges (AOC) which represents 339 colleges with nearly one million 17/18 year olds, with about 200,000 young people with a declared learning difficulty/disability. Alison pointed out a few times that there are now only a few months to go to the new SEN framework and that she was concerned that people were not ready for the new duties that they would have to have regard to. She pointed to the fact that there was a helpful document from the DfE entitled: 'Implementing a new 0 to 25 special needs system: Further Education‘ which gave guidance on what Colleges needed to do, but she expressed concern that ‘Learning Difficulty Assessments’ (LDAs) - the current system used for young people in Colleges (which are supposed to be similar to ‘Statements’ in Schools), are not always prepared/passed on. She said that, sometimes,when young people do get to College, the College does not always know why they are there! Alison also raised other concerns: about funding gaps (particularly in the NHS); the sustainability of support for 16-25 year olds; concerns about planning support for students living away from home; employment opportunities; the need to empower young people/parents/families; and the need to extend support practically and effectively for 16-25 year olds. A couple of weeks later at The Transition Event, I heard a number of speakers again, both in the conference and in the workshops that ran alongside it. I heard many people highlighting again the difficulties with transition for young people from Year 9. I also noted the concerns from both parents and professionals about the lack of consistency between schools and colleges. There were lots of questions about the ‘Local Offer’ (i.e. the SEN/disability provision availability in the local area to those 97%+ of children/young people without access to a Statement/LDA). I was most taken by a presentation given by Stuart Lackenby from Dudley LA entitled: ‘Changes to How LAs Work’. He highlighted the massive change that we all (particularly LAs) are now facing. He also pointed out that LAs could only work smarter/more efficiently up to a point, but said that there was an expectation on them now to deliver more for less. Stuart said that there would now be joined-up/shared budgets and very complicated funding arrangements and said that often the ‘left-hand would not know what the right hand is doing’. 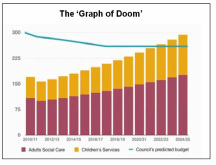 He referred to (but did not show) a ‘Graph of Doom’ which he said has been doing the rounds in the past couple of years, which he also said showed that by around 2030, according to a graph of the funds available to LAs, compared with their legal duties, there would be an inability to provide any services except adult social care and children’s social care. 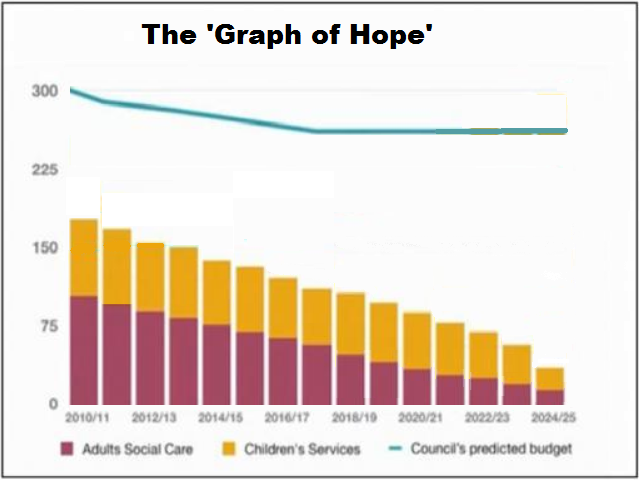 Stuart pointed out that the graph was prepared a couple of years ago but he was concerned that now there may not be enough funding for everything as early as 2017. Not a happy talk! 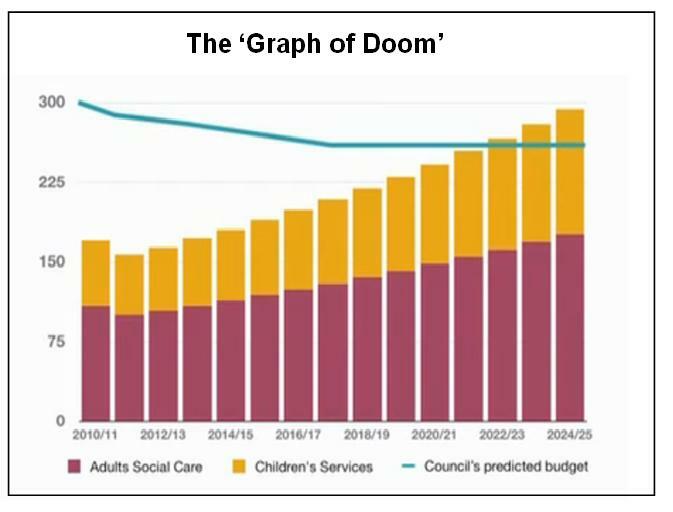 On my way home, I immediately searched on the Internet for the ‘Graph of Doom’ (don’t you just love how mobile technology now makes this sort of thing so easy!). I think we all need to realise by now the inherent tension that we have in our SEN system, where parents of children/young people understandably want the best for their child but LAs have limited resources and extensive statutory duties to meet. This is why we need to work together effectively to ensure that we resolve disputes as quickly and amicably as possible without wasting valuable resources. Let's hope that this will be where we are headed?